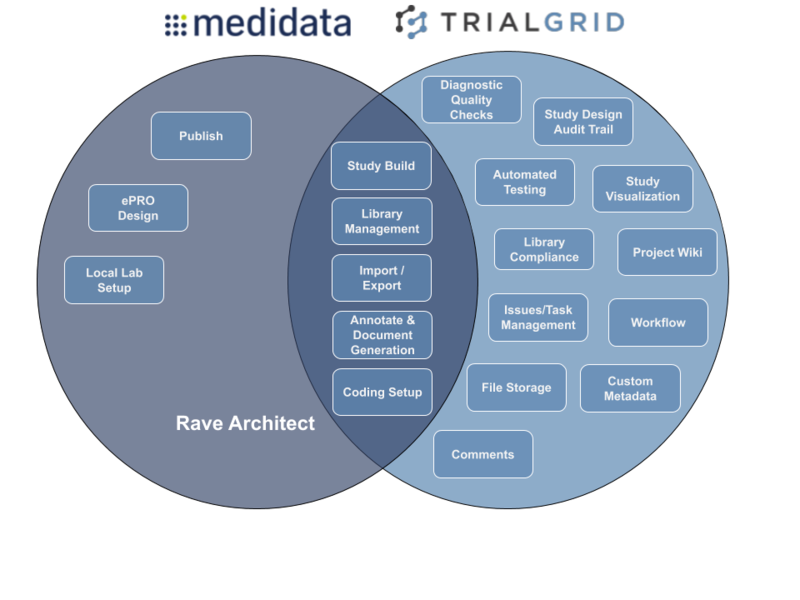 TrialGrid is a single environment for the Medidata Rave® Study Build Lifecycle. ...All in a single online tool with team collaboration and communication built in. There is much more to building a Medidata Rave study than just creating Forms and Edit checks. As a manager you want to know who is working on the study and its current build state without having to consult a resourcing spreadsheet, a specifications document and a project notes document. TrialGrid gives you an audit trail of all changes made to a study, a task management system, project file storage, workflow states to track progress and a project wiki where the team can collect design notes on the study. If you planned to make use of a Standard Library then you'll want to know whether your study build is compliant with that library and how much re-use you are getting from the standard. Medidata Rave® Clinical Programmers will get a big productivity boost from using TrialGrid for study build. Study design objects like Forms, Edit Checks and Custom Functions can be flagged with custom workflow states. Comments can be added to any object allowing the team to collaborate on study build. Does your study build conform to Best Practice? Many organizations perform manual checks or run SAS® programs or Excel macros that perform quality checks. TrialGrid builds these checks right into the tool where findings can be instantly actioned. With more than 100 automated Diagnostic checks, best practice conformance is a click away. Need to provide documented evidence that your Edit Checks, Derivations and Custom Functions have been tested? This can be the most time-consuming part of delivering the Study. TrialGrid's unique Automated User Acceptance Testing (UAT) generates test data, executes tests and collects screenshot evidence at the push of a button. Works with Classic Rave and with Rave EDC. Our mission at TrialGrid is to improve the quality and efficiency of clinical studies by providing advanced software tools for clinical research professionals. Medidata Rave is the market-leading Electronic Data Capture system. Our goal at TrialGrid is to make the Medidata Rave experience even better by providing tools that supplement and enhance Medidata's offering. We believe the business proposition for clinical developers using TrialGrid technology combined with Rave is excellent no matter what the study type or phase. We want you to liberate the power and flexibility of Rave with TrialGrid. How does TrialGrid Compare to Rave Architect? Rave Architect is a good tool for study builders but it does not support the full range of activities to take a study design from planning through build, quality checking and testing. TrialGrid supports all the stages of the process in a single combined tool. Want to learn more about how TrialGrid can accelerate your Medidata Rave®Study Build and improve Study Build Quality?